Most Hard Rock bands don't last over thirty years, let alone retain their original line-up through all that time - but BABYLON A.D. is most definitely the exception to the rule. Their studio album "Revelation Highway" proves to be a wonderful way to celebrate this achievement. Think WHITESNAKE with a hint of BOSTON, and that's pretty much what we have here. 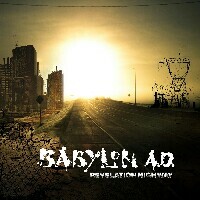 Quite refreshingly, BABYLON A.D. have managed to not lose any of their edge; in fact, they've added to it with a much more mature sound than found on their previous efforts, and a vocal style that simply makes the music on this record fun to listen to. This album opens with what can only be described as a Hard Rock anthem, "Crash And Burn" - which is an ode to the freedom found on the open road. The guitars are stacked, yet they flow with ease underneath the talented vocal stylings of Derek Davis. "Fool On Fire", the second track, continues where the first left off, solidifying what is in store for the listener - a long and winding journey down the "Revelation Highway", which is chock full of twists, turns, and parties all along the way. Track three, "One Million Miles", introduces us to the softer side of BABYLON A.D., and does a fine job of showcasing the talent possessed by the band's guitarists. The fourth song, "Tears", further expands upon this, boasting a duelling solo that BOSTON would most assuredly be proud of. The record moves along nicely, each tune doing well what a good Hard Rock tune does - keeping heads bobbing and filling the listeners' minds with memorable and catchy choruses that just don't let up. Needless to say, most groups in the genre of Hard Rock hit a brick wall well before the thirty-year mark, and the ones that do make it that far tend to lose the sound that made them famous in the first place. With BABYLON A.D., we find all the original members being more than capable of rocking just as hard as they did back in the 1980s, and bringing great production value into play. I myself find it hard to listen to straight ahead Hard Rock bands nowadays, mostly because a vast majority of them are merely recycling the same few songs over and over again, never expanding upon the formulaic nature of the genre, and seem afraid to bring any sort of production value to the recordings themselves. This band manages to make Hard Rock fun again, and have proven with this ten-song full-length "Revelation Highway" that Hard Rock is far from dead. One of the stand-out tracks for me was the eighth song on the record titled "I'm No Good For You". A mid-tempo jam, this song gets straight to the point. Guitars, bass, and drums meld perfectly with rich keys to provide the perfect backdrop for the vocals, which again fail to let up during the song's short duration. Put into simpler terms, it's just a ‘feelgood’ song that is written flawlessly, and exhibits a fine quality of both memorability and musical prowess. In conclusion, BABYLON A.D.'s "Revelation Highway" is just that; an old highway that, when travelled, is full of life, freedom, parties, fleeting romances, and just the right amount of danger. I strongly encourage any fans of real Hard Rock to take a trip down this particular highway, ignore all the caution and speed limit signs, and feel the stories and fables that result as you leave all your cares behind to focus on where the road takes you next.